Originally developed for mobile platforms, Bloo Kid 2 was well received back in 2014; indie developer 'winterworks' delivered a solid 2D platformer with responsive touchscreen controls. Although still a decent choice for the discerning mobile user, Bloo Kid 2 clearly becomes a much tougher proposition on the Nintendo 3DS eShop; now sitting alongside many of the games it very clearly takes inspiration from, is it good enough to warrant your time and hard-earned cash? Initial impressions aren't too encouraging – the title screen logo looks like it's been drawn by a young child and the main character is instantly forgettable. From the beginning, only the first of five worlds (chapters) is unlocked, the remainder open up in a linear order as you make progress. 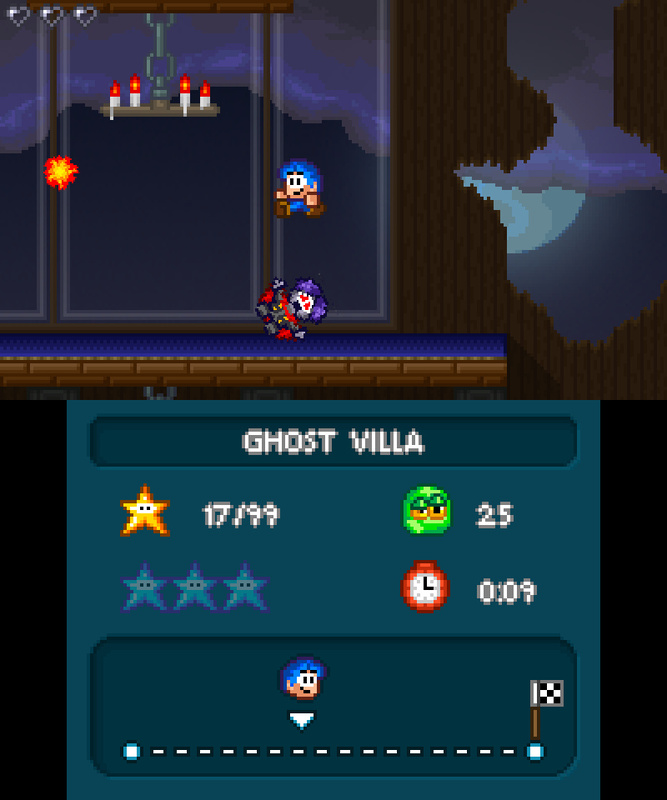 There are nine stages per chapter; the fourth and eighth stages of each are roughly equivalent to Mario's castle stages, with the final ninth level always being a boss stage to overcome. Thankfully as soon as the title screen is passed, things begin to look up. Even though the artwork is hugely derivative, it's beautifully drawn in a lovely retro pixel style; a plethora of bright colours and contrasting background artwork helps the foreground elements to really pop out. The stereoscopic 3D effect is mostly well done and contains a decent amount of depth, although it does suffer a little bit from the paper cut-out effect that's seemingly unavoidable in 2D games such as this. 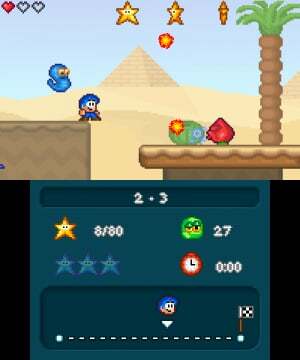 Bloo Kid 2 contains a slew of blatant plagiarism of various genre classics, with the list of inspiration from past games being almost endless. Everything in sight is seemingly pulled from elsewhere; there's even a mine cart level chucked in for good measure. Ever played Sonic the Hedgehog? How about Alex Kidd or Mario? You'll not find any surprises here. The worlds are all themed pretty obviously too, from the starting 'Green Hills' zone (yes, really) through to a desert theme and an ice theme - it's all so far so yawn, especially if you've trod the platform path throughout the years. However, if you are able to accept that Bloo Kid 2 has practically no ideas of its own, it's possible to switch your brain from dismissal to a weird enjoyment through spotting all the obvious gaming references contained within. This is an important step to accepting what's on offer here - a willingness to embrace the lack of originality. Is it paying homage or simply a rip-off? Only you can make that decision. The actual gameplay is solid. Bloo Kid is responsive and there's a pleasingly weighty and chunky feeling to the physics. Blessed with a double jump, it soon becomes second nature hopping from platform to platform and bouncing off every enemy in sight. 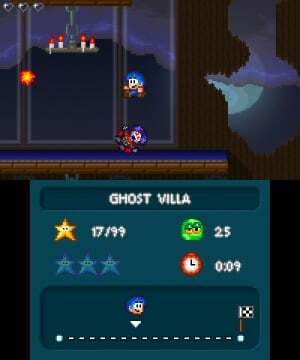 The developer has made an odd choice by not allowing use of the Circle Pad at all – you HAVE to use the D-Pad to control Bloo Kid, so be wary if that's not usually a comfortable option for you. All in all though, it plays great. The pacing and structure is equally well done, even if it's painting by numbers. As stages progress, new enemies are introduced, with some employing attack patterns that must be learned in order to effectively avoid or defeat them. The learning curve is spot on and while it's not the hardest game ever made, it's no push-over either. 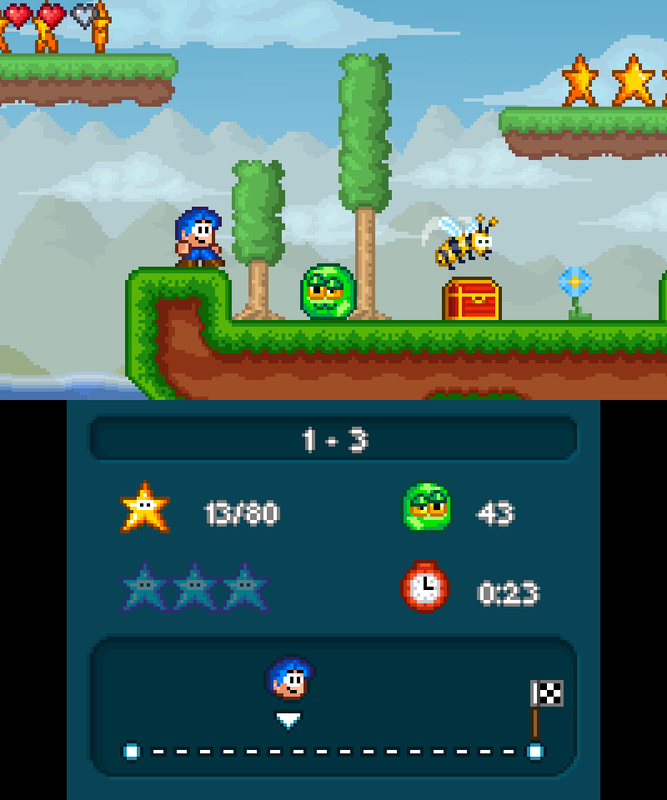 Bloo Kid can take four hits before a life is lost, which seems fairly lenient to begin with, but towards the end of the game you'll be thankful of the extra hearts to be found inside various chests dotted around the stages. 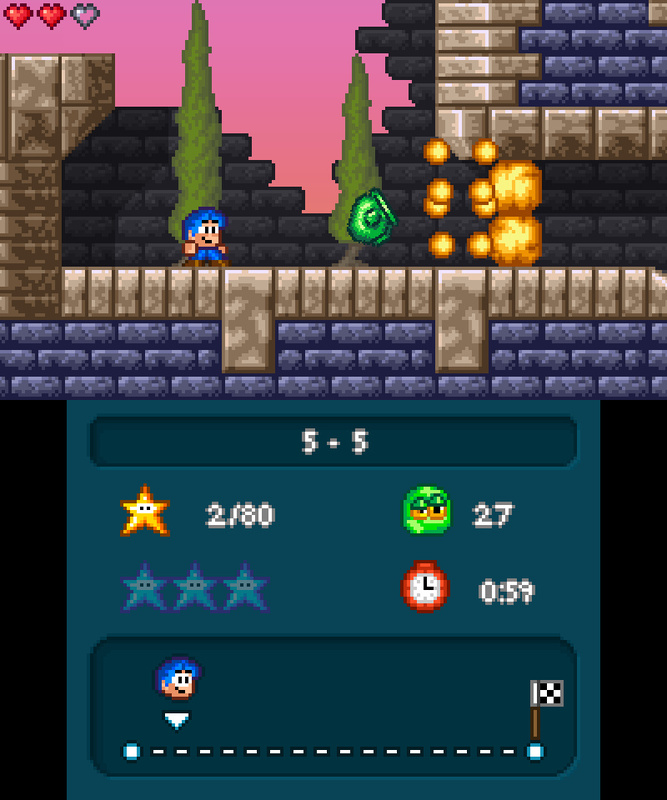 The stages themselves are cleverly designed, scrolling from left to right with some climbing and descending now and again; each is also filled to bursting with enemies, collectibles and hazards. You'll never get lost, but there's a touch of off-the-beaten-track exploration to be had if aiming to 100% the entire game. 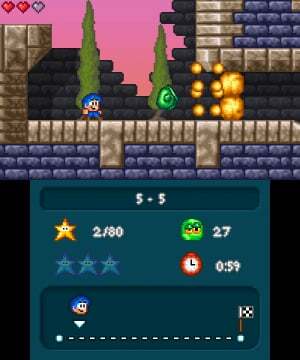 Each stage has a number of objectives to aim for, be it collecting all the stars, finding three special blue stars (usually hidden) or defeating all the enemies. These objectives will generally take you a couple of tries per stage, which serves to artificially extend the length of the game. 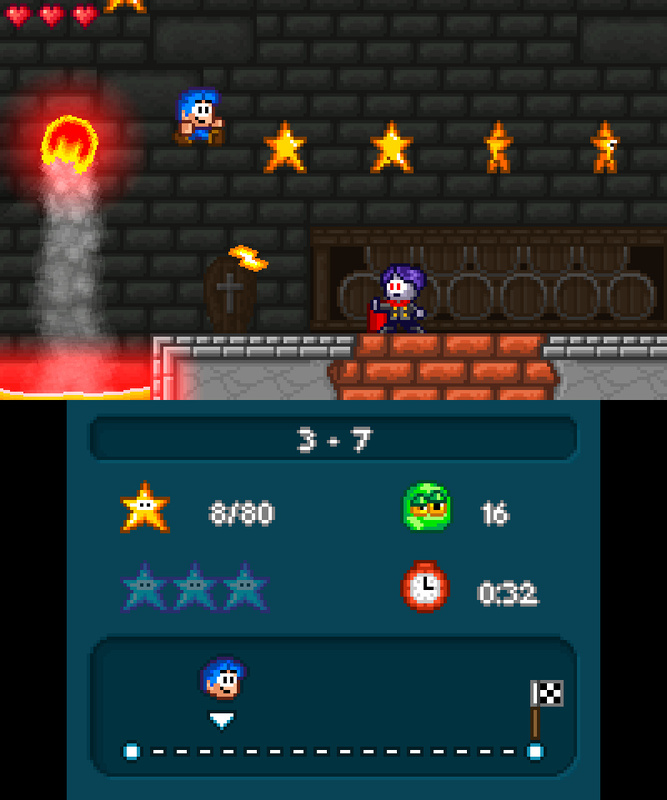 The most difficult is beating each stage's time target, but also arguably the most fun. Charging through the harder levels with barely a pause for breath requires skilful dexterity and some layout memorisation. 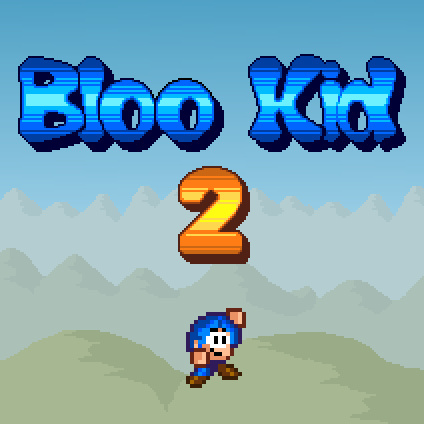 Additionally, if you happen to have a love of old school style chip-tunes, Bloo Kid 2 delivers. There are plenty of catchy ditties reminiscent of the good old days; in particular listen out for nostalgically familiar C64 Sid Chip style sounds splodging amongst the soundtrack. Almost brings a tear to the eye. And that's kind of it – there's nothing ground-breaking here, just a solid, colourful platformer with spot-on controls and challenges should you choose to take them on. It's also cheap and cheerful, so if you're pining for a new platform game to keep you busy for a few hours, you'd do well to consider Bloo Kid 2. Yes, it's unoriginal, but Bloo Kid always has a smile on his face while jumping on those generic enemies and at least the inspiration is coming from the right places. Give him a chance, he's trying his best. Eh, I'll give this one a shot. Looks good for the price,But the fact you can't use the circle pad puts me off,as I don't like the 3DS d pad. Looks like an extremely generic 90's platformer, but if there's more music like what's in the trailer I may cave in and get it. Long live bleeps and pixels! Well, sometimes you don't want a game that reinvents the wheel, you just want something well designed and playable that nails down the basics. This looks like a good choice for that. Price isn't bad, either; I'd rather pay 4 bucks than play a "free" game any day. Just imagine you're playing a lost DOS platformer! Being only 4 € I'll probably get it some day. I'm always ready for some platforming. I downloaded this game on day one & I love it. It's really enjoyable. I highly recommend it. I played through the first world of this last night and I'd totally give it a thumbs up. My initial thought as I began bouncing through the first stage was 'This is what you want, right here'. I may have even said it out loud. I don't think I'll 100% the game (that timer is the devil), but will definitely play it through to the end. Might download it soon. Looks fun, even if it nicks baddies from other games. I saw this game on the E-Shop today and for the most part I agree that it seems to be a pretty average platformer gameplay wise, though that isn't necessarily a bad thing. I still have plenty of other platformers on my 3DS that are yearning to be played so this will have to wait for now. There, downloaded! Not bad so far (only played 2 stages). The 3D is weird though. You can stand on stuff in the background, but you stay the same size. By the way: Is there also a Bloo kid 1? I'm surprised this hasn't been the target of lawsuits. kind of sickening how much they're ripping off. I mean, the tree from Kirby, thwomp, seriously? There's inspiration and then there's stealing. Some inspiration from Kirby, Mario and Donkey Kong Country games. Looks like a decent platformer for only $4. That tree looks like Whispy Woods from Kirby and it doesn't even look different! How does every indie dev get away from stuff like this? Even better, how did Nintendo let this happen? I think I'm too stingy to buy this. Even counting the fee to remove ads, this is twice the price of the mobile version. "Give him a chance, he's trying his best"
That's the exact same feeling I got from the guy ever since I saw him on the eShop. I think I just might adopt this kid. The enemies and the balloons are the hardest stars I'm having to get. I can never find every enemy and those balloons require a lot of trial and error. Really enjoying the game though. Great game, played it on iOS and snapped it up straight away for 3DS. Some of those blue stars though.....fiendish. @ueI What about the advantage of not having to play it on a phone? To me that's worth quite a bit. This is a great little game, really recommend it to platformer fans like me who grew up with the C64 and Amigas! @TulipWaltz Yeah, it probably is. @ToneDeath I agree that it looks that way but after playing it I feel that the gameplay is better than just a copy. It does its own thing in a lot of ways, it just happens to borrow a lot graphically that makes you, at first, look at it and think "well that's just a blatant rip-off!" I've been loving the gameplay in this $4 eshop game, and I wouldn't dare play this on mobile with touch input. I imagine that would be awful and wouldn't do it justice. This game has a great flow and is built beautifully to test speedrunners. I say pick this up! Eh, I'll add "Super Bloo Alex Kidd Bros. Country Dreamland 2" to my wishlist... why not? The Nightmare difficulty, which I unlocked yesterday for beating Hard, kind of hilariously makes the difficulty feel like Mario again because on that mode you have only one heart, so you can only take two hits before you have to redo the level. Hey, it does the job well, that's for sure. It's much more challenging that way and Bloo Kid 2 really seems built around encouraging you to come back and play some more instead of moving on. You also unlock a boss rush and time attack mode when you finish the game once. Boss Rush is nice enough but the bosses do not (that I can tell) have any kind of secrets to beat them faster. They all share the same formula of avoiding the boss's attacks for a bit, then the boss will offer a way to damage him. You damage the boss three times and you win, that's it, move on to the next. If only the bosses had something about them, some cool secret unique to each to beat them faster that was a lot harder for the player to achieve, then I wouldn't mind each sharing the same basic formula but this isn't the case. Bottom line, though, this game works well and I've fully enjoyed my time with it although I had to warm up to it in the beginning. Comparing this to when I purchased Jett Rocket II - what can I say, this game is actually fun and the level design trumps anything you would find in JRII. Nintendo Life happens to have both games at a 7/10 but Bloo Kid 2 is far better, IMO. Dunno why I pulled the trigger, I guess the gameplay looked alright, I love platformers and used to play games like these all the time in DOS. Let's see how it goes. Alright, played it. Not bad. Good old school mechanics and level design, so they did they homework there. Strictly by the book, but a good effort nonetheless. Not at the same level as something like Mutant Mudds though. 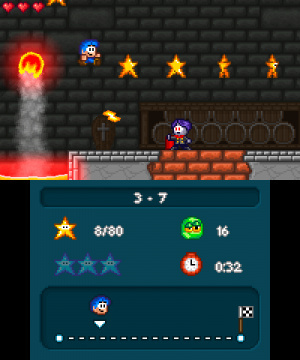 I also see they added circle pad support, checkpoints and probably some extra levels in the update.